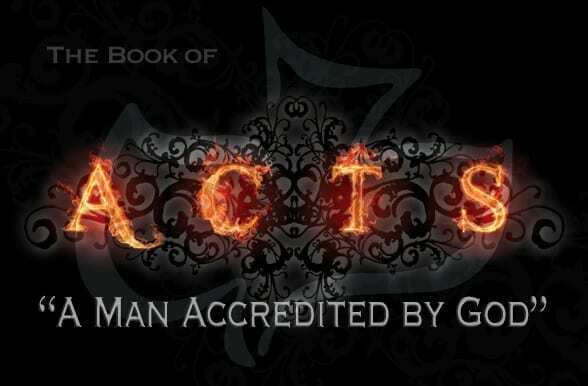 The book of Acts forms the biblical link between Jesus Christ coming to fulfill the Old Testament promises to Israel and his beginning the Church (the “Body of Christ”) on the Day of Pentecost.1 It presents a clear and unified witness of the Apostles’ view of Jesus Christ, and what they taught as “the Apostles’ Doctrine.” They viewed him as the Son of God, a man sent by God to be the promised Messiah, first to Israel, then to the Gentiles. They were convinced of his Messiahship by his resurrection, which they boldly preached as they fanned out throughout the Mediterranean countries. Nowhere in Acts is there any suggestion that Jesus was “God” in any sense, and this omission is remarkable if this doctrine were in fact a part of apostolic Christianity. After the ascension, the book of Acts then describes the growth and development of the early Church as Christ gave and guided these ministries to act in his stead, causing spiritual growth in the lives of all those who followed him. But Christ was not just working with these “equipping ministries,”2 as they are sometimes called. He worked directly with his brethren, like Ananias, “a certain disciple” (Acts 9:10 – KJV), or indirectly with them through those to whom he had specifically entrusted with the ministry of apostle, prophet, etc. What was clear to the first-century believers was that Christ was no longer physically present to do his work, so they were supposed to be doing it. But they were to do it by the power of the holy spirit that he had given them, and in conjunction with his continued leading of them. This they were to continue to do until they saw him reappear through the clouds, which they expected to happen in their lifetime. The first reason it was not possible for death to hold Jesus is because God Almighty, the Creator of the heavens and the earth, who cannot lie, had promised in Old Testament prophecy that He would raise His Son from the dead. That is why “the gates of Hades” (Matt. 6:18) will not be strong enough to retain its captives.4 It was also not possible because Jesus Christ was a righteous man without sin, who did not deserve the penalty, or “wages,” of sin, which is death. Therefore, God could legally and ethically raise him from the dead. Again we see the absolute urgency of his obedience to God, for a single sin would have made it possible for the grave to hold him in its clutches. Was Peter identifying Jesus as the Yahweh of the Old Testament?6 Hardly. He was instead proving from Scripture that Jesus was the Christ, that is, Yahweh’s Anointed One. According to Scripture, the Christ (Messiah) had to suffer and rise again. In addition, as the Christ of Old Testament prophecy, Jesus had been exalted to the right hand of God and installed by God as Lord over all. In short, he had entered into his glory (Luke 24:26 and 46). As we saw in Chapter 5, the Jews regarded Psalm 110 as a Messianic prophecy concerning the coming Christ. Psalm 110 also speaks of the coronation of a king, in this case, a king from the line of David. In its original context, it may have been speaking of Solomon, but in its larger context, it was either a foreshadowing or direct foretelling of the future Davidic king, that is, the Messiah or Christ. Remember that to Peter’s audience on the Day of Pentecost, the Hebrew understanding of the text would have been clear. The Messiah (or King) who is being installed in Psalm 110 is referred to as Adon, not as Yahweh. Yahweh was the personal (proper) name of God in the Old Testament. On the other hand, Adon was a descriptive name meaning “Lord.”7 Unfortunately, both of these terms were translated from Hebrew into the Septuagint (the Greek Old Testament) as kurios and then later into English as “Lord.”8 In our English Bibles, they are distinguished only by various means of capitalization within the Old Testament. No monotheistic Jew living at that time would have taken Peter’s statements recorded in Acts 2 to mean that the Messiah (or Christ) was Yahweh, that is, God. This would have been ludicrous to them, and had Peter proclaimed this, no one would have given him the time of day. Instead, Peter clearly set forth that it was, in fact, God Himself, Yahweh of the Old Testament, the God of their fathers, who had raised Jesus from the dead and highly exalted him to the heavenly position of Lord in fulfillment of the Old Testament prophecies concerning the Christ. As Philippians 2 states, God elevated the man He had named “Jesus” (meaning “Yahweh our Savior“) to the most highly exalted position possible. Thus, his name is above every name. Can “deity,” that is, that Jesus is “God,” really be ascribed to him on this basis? No. “Lord” is simply the most appropriate title for Jesus, especially now that he sits at God’s right hand.10 This is one of the many places where the NIV translators have endeavored to imprint their own Trinitarian belief either onto the text itself (via their translation) or onto the understanding of the text (via their study notes). Some examples of other places include: John 1:1 and 18; Romans 9:5; 1 John 5:20.11 This list could go on and on. In pointing out these examples, we do not mean to denigrate what we consider to be an excellent translation. They are simply indicative of the extent to which the Trinitarian interpretation has colored the understanding of most translators and Bible scholars. So ingrained is it in most Christians’ minds that seldom do any of their thoughts about its illogic lead them to seriously seek any alternative. Another consequence of not seeing the difference between “Lord” and “God” is the fallacious idea that one is not saved unless he believes that Jesus is God. This is in spite of the clarity of Romans 10:9, which says that salvation is dependent upon confessing that Jesus is Lord. There is no verse that says to be saved one must believe that Jesus is “God” or “divine.”12 Furthermore, in all the records in Acts, there is no presentation of the Trinity. For example, as we have seen, about 3,000 Jews were saved on the Day of Pentecost without Peter mentioning the Trinity or that Christ was somehow God. The Roman soldier Cornelius and his household were saved in spite of the fact Peter never mentioned the Trinity. The jailer in Philippi was saved, and Paul’s words were short and to the point: “…Believe in the Lord Jesus, and you will be saved…” (Acts 16:31). The book of Acts shows that Jesus had not lied when he told Peter “…I will build my church….” We see Jesus Christ actively and powerfully working to build and support the Church, which is his Body. He pours out the gift of holy spirit to all who believe. He adds to the Church those who call on his name. He heals people. He is supporting the outreach of his Church in many ways: by signs and miracles and by specific guidance and revelation. Records like the vision he gave to Peter on the rooftop show him preparing the hearts of Christians for ever greater works of service. That he personally appeared to Paul on the road to Damascus shows him building his Body and lightening the persecution of Christians at the same time. The book of Acts also records the history of the early Church as believers reached out with the Word, first to the Jews, and then later to the Gentiles. In the early part of the book of Acts, despite Jesus’ admonition to his followers to “go unto all nations,” the message of salvation by grace through faith in Christ was preached only to Jews. Acts faithfully sets forth the growth of the Church. First the Jews, then the Samaritans (Acts 8), then the Gentiles (Acts 10). It sets forth the actions of the Church as the Lord Jesus began to reveal the truths that set the Church of the Body apart from the “Old Testament.” These doctrinal truths are clear in the Church Epistles, which set forth the truth about the “administration of grace,” in which all believers, no matter what their nationality or heritage, Jew and Gentile alike, form the One Body of Christ. The truth of the “Sacred Secret” (often mistranslated as the “Mystery”) that is set forth in the Church Epistles was unfolded gradually throughout the period covered in the book of Acts.13 As we shall see, Jesus Christ will one day confirm all of God’s promises to Israel (Rom. 15:8). He will also give everlasting life to all Gentiles who call upon his name. Stephen did not look up into heaven and see a Triune God, he saw God on His throne, just as the elders of Israel and prophets had seen.14 And at the right hand of God stood the resurrected Christ. Stephen was so blessed and amazed at the vision that he shouted out what he saw, even though no one else could see it. As the Head of the Church that began on the Day of Pentecost, it was the Lord Jesus Christ who spearheaded the outreach of God’s Word as recorded in the book of Acts. He is the Lord who spoke to Ananias about going to see Paul, and the one who spoke to Peter on the rooftop about going to see Cornelius.15 He is the Lord whose power energized the many signs, miracles and wonders done by those who believed in him and who went forth in the authority of his name. 1. Scripturally, the “Body of Christ” is figurative language that refers to the Church, that is, all Christians. Jesus Christ is called the “Head” of his Body, the Church. Thus, in the Church Epistles, Christians are referred to as being “in Christ.” Since every human being is born dead in sin, he must be “born again” in order to have life in Christ. That New Birth happens the moment one confesses with his mouth that Jesus is Lord and believes in his heart that God raised him from the dead (Rom. 10:9). It is via the New Birth that one receives spiritual life and a guarantee of living forever in Paradise. At the moment of one’s New Birth, he is endowed with holy spirit, “power from on high,” “the divine nature,” which equips him to be like Jesus Christ and do the works that Jesus did. What did Jesus do in his body during his earthly ministry? He expects those who believe in him to do the same things, and, in fact, he told them that they could (John 14:12). Jesus Christ is called “…the firstborn from among the dead….” As such, he was the Head, but he did not have a body until the Day of Pentecost when the Church, the “one new man” (Eph. 2:15), was born. That spiritual organism has been growing ever since as more and more people are added to it by way of their belief in Christ and resulting New Births. It is the Lord Jesus Christ who pours out the gift of holy spirit into the heart of each new person who believes in him as Lord (Acts 2:33). In that moment it is as if Jesus pulls you from the dead group into which you were born and places you in his Body so that you are now part of him. For more detailed teaching on this, listen to our audio teaching: The Purpose of the Ages (May/Jun 97). 4. The phrase, “the gates of hell” has been popularized and thrown around in Christianity with little or no understanding of its real meaning. The phrase is usually used in emotional sermons designed to inspire Christians to storm the Devil’s stronghold. The Greek word translated “hell” in the KJV is hades, and it is transliterated into “hades” in the NIV. Hades was the Greek word used in the Septuagint to translate the Hebrew word sheol. E. W. Bullinger has an extensive study of sheol in his lexicon, and concludes: “Sheol therefore means the state of death; or the state of the dead, of which the grave is a tangible evidence.” Thus hades describes a state of being of dead people, equivalent to “gravedom.” Biblically, it is not a literal place with literal “gates.” Our book op. cit., Is There Death After Life? covers the subject of sheol in Chapter 4. When Jesus Christ said that “the gates of hades” would not be able to prevail against his Church, he was using the phrase in the same way it is used in the Old Testament, where it occurs twice, using the word sheol. Job asks, “Where then is my hope? Who can see any hope for me? Will it go down to the gates of death [sheol]? Will we descend together into the dust?” (Job 17:15 and 16). In the book of Job, the “gates of sheol” are the gates of the grave. When someone dies, it is as if gates were permanently shut behind him. There is no way out, no way back to the land of the living. 5. If David is not in heaven, great believer that he was, then where is he? He is dead and in “gravedom” awaiting resurrection at the hand of the Messiah. The Bible teaches that all who have died will stay dead until they are resurrected by Christ. 6. For more information on the name Yahweh, see Appendix L.
7. For specifics on this verse see Appendix A (Ps. 110:1). 8. See Appendix B for a detailed examination of Kurios. 9. See Appendix A (Rom. 10:9). 10. See Appendix B, Uses and Usages of Kurios. 11. For our explanation of these verses see Appendix A. 13. For an explanation of why the Greek word “musterion” should be translated “Sacred Secret” see our book: op. cit., The Gift of Holy Spirit, Appendix A, of that book. 14. See Appendix A (Gen. 18:1 and 2). 15. In Acts 10:14, Peter recognizes that the source of the vision was the “Lord” (see Appendix B). But in verse 15, the voice from heaven says, “…Do not call anything impure that God has made clean.” When Peter is recounting his vision to the circumcision “police” in Acts 11:4–18, he says the same thing. Had God been speaking directly to Peter, He would have said, “Do not call anything impure that I have made clean.” The use of the third person here argues for the source of the vision being Jesus Christ and not God Himself.